Old issues surface at new superintendent’s first meeting – Welcome to Wyandotte Daily! 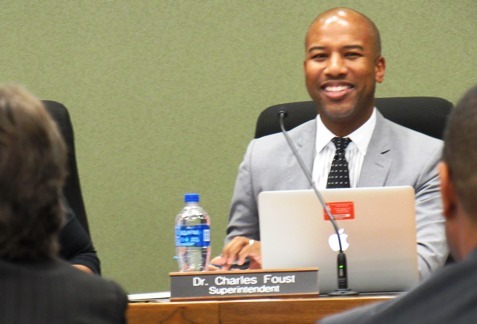 The first regular Kansas City, Kansas, Board of Education meeting under Superintendent Dr. Charles Foust went smoothly for about 95 percent of the Aug. 14 meeting, but toward the end, an old issue resurfaced with a board split on the issue of a compliance audit. “Thank you for the kind gestures that have been made toward me,” Dr. Foust told the board and audience early in the meeting at the district’s Central Office at 2010 N. 59th St. About 50 people attended the meeting. Since arriving last Tuesday, he has been going nonstop to make sure everything was in place, he said. The first full day of school in the Kansas City, Kansas, Public Schools was Monday, Aug. 13. “It has just been an outpouring of kind spirits,” he said about his welcome by everyone at the district. Dr. Foust most recently served in the Union County Public Schools in Monroe, North Carolina. Before that he was with the Houston (Texas) Independent School District. He has served as a classroom teacher, principal and administrator. He has turned some low-performing schools into award winners. Toward the end of the Aug. 14 meeting, the board approved an addition to the compliance audit of administrative staff with Corporate Integrity Systems. The board previously approved an $85,000 contract with CIS on June 2. The contract addition approved tonight defined administrative positions as all personnel positions that were not teachers, police officers or library employees. The addition also required all district employees and contractors to cooperate with the audit. CIS will have access to all personnel files and access to payroll information. Another addition to the contract stated that while CIS will have access to the information, the information will be kept confidential. 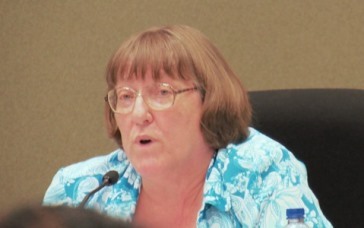 Board member Janey Humphries said she had been contacted by community members and district employees who had concerns about the compliance audit. She said employees are concerned about an outside entity having access to their personnel records, which includes their health records, information such as their Social Security numbers, plus any reports or complaints that may have been made against them in the past. She said they were concerned about data leaks. The audit’s purpose was to have found if recruitment, hiring and compensation for administrative positions were in compliance with the board’s policies. Humphries said she had believed this audit was for the top administration positions, including those who managed other people. But the definition approved tonight stated that all positions except teachers, police officers and library employees are administrative positions subject to the audit. That includes such positions as bus drivers, food service workers, paraprofessionals, information technology and custodial workers. She said she also was concerned that the no-bid contract with CIS doesn’t have stated objectives, something that the district requires of its own teachers. Humphries’ full statement is at the end of this story. Employees are perceiving this audit as a threat, she said, and are afraid they will lose their jobs if they don’t answer their questions. Humphries said the board members should be policy-makers, not administrators. They should respond to the recommendations of the superintendent and the administrators, she said. Dr. Valdenia Winn, board president, said this is a compliance audit. The district has regular financial audits. A confidentiality agreement is in place. The board followed the board’s policy when they considered it and hired them, she said. The board has the authority to hire consultants, she said. During the meeting, Dr. Foust reassured the employees that no one would be terminated from the findings of the audit. “What we will do is look at the facts that are brought forward, make sure the policies were followed, in the event they were not, we would allow folks time to get the credentials that are needed,” Dr. Foust said. Four board members voted in favor, Humphries voted against it, while Brenda Jones and Maxine Drew abstained from the vote. The board clerk said the abstentions would be recorded as no votes, for a 4-3 vote. After the meeting, Dr. Winn explained why the board wanted a compliance audit. “We want to see if our job descriptions fit our needs. If people in those positions have the credentials, the salary is consistent, is it adequate, and that all the hiring, promotion policies fit our board policies,” Dr. Winn said. “It’s not threatening, it’s an assessment of the hiring, promotion, salary practices, if they’re consistent with our policies,” she said. The audit will include positions such as bus drivers in the event they want to evaluate the district’s transportation system, not to specifically evaluate bus drivers, but to be broad enough to get the job of the compliance audit done, according to Dr. Winn. The library is currently undergoing its own evaluation, she said. Teachers have negotiated their own system, where their qualifications may include a certain number of college credits. “The police officers (the school district has its own police force), we felt that this was a separate unit,” Dr. Winn said. If a person is in a position that is not consistent with policies, promotion or job description, there has to be consideration for it, she said. Are they good at their job, did the job require them to get management training, she asked. The district may give them the opportunity to get training, she said. The board also went into a closed, executive session at the Aug. 14 meeting to discuss superintendent goals with Dr. Foust. In other action, the 2018-2019 budget passed, with no comments from the public during a public hearing. “I struggle with understanding the question that we are trying to answer? “Clearly there is a desire to expand the current audit to include non-administrative positions. Why? 1. Definition of Administrative Positions. “Administrative positions” shall include all positions considered administrative, including but not limited to Officers, Directors, Executive Directors, Coordinators, Instructional Coaches, Technicians, Bus Drivers, and Administrative/Board support. Administrative positions include all positions referred to as the “Administrative tier.” Administrative tier positions include all personnel positions at KCKPS except teachers, police officers, and library employees. Why are these three exempt? “In general administration includes the superintendent’s council, executive directors, directors, coordinators, managers, principles, and assistant principals. These positions are charged to manage programs, and evaluate employees. “Administration are positions that manage and evaluate programs and staff. Instructional coaches and bus drivers, nutritional service workers, IT, shop and custodial, paraprofessionals, etc.. These positions do not evaluate or manage programs. “If we’re trying to understand the cost of administration in the district, we should use the definition that is required by the state accounting system. “Efficiency studies have been conducted by the Kansas legislative post audit of the district. Have we reviewed the results? Would it not be practical, and prudent, to review this report to determine whether or not the district is overstaffed with administrative positions? “We received a report at the June 26th, 2018 BOE Mtg under Superintendent’s Communications from Integrity Consulting Solutions, regarding 6 individuals that Dr. Winn identified as victims of discrimination in her April 17th, 2018 email, which found no evidence of discriminatory hiring practices. She did make some suggestions to improve communication between applicant and HR etc. The previous contract with CIS was signed on June 2, 2018. How much work has been done under this contract? What are the results? “How much of the $85,000 in taxpayer money has been spent to date on this investigation? (Equals about 400 days of substitute coverage) Have time sheets been submitted documenting work done? “Have some specific problems been identified that require further investigation? “And if not, then what is the point of the contract addendum? “The Board as a whole has not received any reports from this company. “Again I would ask for clarification: what is the question or questions that we are trying to answer? “How is the CIS inquiry expected to improve the District? ‘This contract doesn’t have parameters or objectives. “We require our teachers to post objectives and learning goals using the scales. “We require that because we want to be transparent, to let students and staff and parents know what is expected of students and how we will measure it. “So what is the objective of this contract? What is being looked for? We don’t let our teachers say “I’ll know it when I see it” we make them explain what is expected and how it will be measured. “Do we not hold ourselves, as the Board of Education to the same standards? “Is this an effective use of district resources and time? “So we don’t know what we are looking for, we don’t know what we will do with what is found, and we don’t even know if this is the lowest responsible price? This was a no bid contract first brought to the Board as a whole during a special Saturday BOE meeting and voted on at the same meeting. Whereas, CIS will prepare a written report of its findings to the Board of Directors. “What personnel and confidential information may be contained in the report to the Board? That we as a Board should not have access to? And this statement: “All District employees and contractors shall cooperate with this Board sanctioned audit. They perceive this as a threat, that if they give the wrong answer or decline to answer any question they fear they will lose their jobs. This is a real concern of employees! “As part of this audit, CIS may obtain or have access to such confidential information whether from interviews, documents or other means. How would you feel it you were one of our employees? Would you want to work in a place that makes copies of your confidential personnel file available to outside entities in this era of hacking and shrinking privacy? “How do we know people’s sensitive information will be kept in accordance with the laws? We have no idea who will be allowed access to the information. Can individual employees appeal for protection from sharing any part of their employment file Medical information? Anything? “If a leak occurs, who will individuals sue? The KCKPS District? Where would the money come from to address such an issue? From taxpayer money intended to provide education for our children! “Are District contractors, like construction companies, vendors going to be asked to provide information internal to their business? Who will do business with us?